The tragedy of Rostam and Sohrab forms part of the 10th-century Persian epic Shahnameh by the Persian poet Ferdowsi. It tells the tragic story of the heroes Rostam and his son, Sohrab. Rostam lived in Sistan, Iran (also known as Persia), hero and one of the favorites of King Kaykavous. Once, following the traces of his lost horse, he enters the kingdom of Samangan where he becomes the guest of the king during the search for his horse. There, Rostam meets princess Tahmina. She admires Rostam and knows of his reputation. She goes into his room at night and asks if he will give her a child and in return, she will bring his horse. Rostam leaves after he impregnates Tahmina and his horse is returned. Before he leaves, he gives her two tokens. If she has a girl, she is to take the jewel and plait it in the girl's hair. If she has a boy, she is to take the seal and bind it on the boy's arm. Nine months later, she bears his child—a son, whom she later names Sohrab. 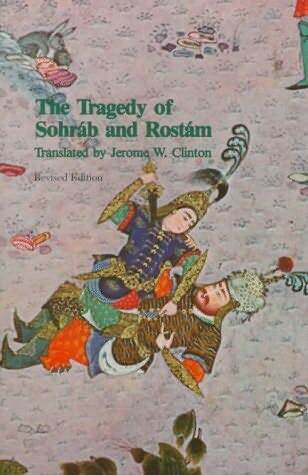 Years go by before Rostam and Sohrab meet. Finally, a new war between Persia and Turan is on the horizon. The two armies face each other and prepare for the imminent battle. By then, Sohrab has become known as the best fighter of Turan army. But Rostam's legend precedes him and the Turan army cowers before the hero. No one else dares to fight Rostam, so Sohrab is sent to wrestle with the legendary Khurasaan hero. Though Sohrab knows his father's name, he is unaware that the man before him is Rostam. On the battlefield, Rostam and Sohrab fight for what seems like an eternity, neither knowing the true name of his opponent. After a very long and heavy bout of wrestling, Rostam breaks Sohrab's back and stabs him. Sohrab, dying, tells Rostam that his father will avenge his death and only then do they realize their identities. Sohrab produces the necklace that Rostam once gave Tahmina, who gave it to her son to keep him safe during the war. Rostam grieves heavily but cannot save his son. When she finds out her son is dead, Tahmina burns Sohrab's house and gives away all his riches. Then "the breath departed from out her body, and her spirit went forth after Sohrab her son." Rustom Sohrab (1963), Indian Hindi language film starring Prithviraj, Premnath, Suraiyya and Mumtaz. Dastan-e Rustam-ou Suhrab, a Tajik film produced by Benyamin Kimyagarov. The film plot differs from the story in some places. For example, Tahmineh comes to the battlefield trying to stop the fight; Rustam gives an arm band (not a necklace) large enough to only have fit his stout arms, and now only fit Sohrab´s arm; and, Rustam uses a poisoned knife to stab his son. ^ "The Internet Classics Archive - The Epic of Kings by Ferdowsi". classics.mit.edu. Retrieved 23 April 2018.